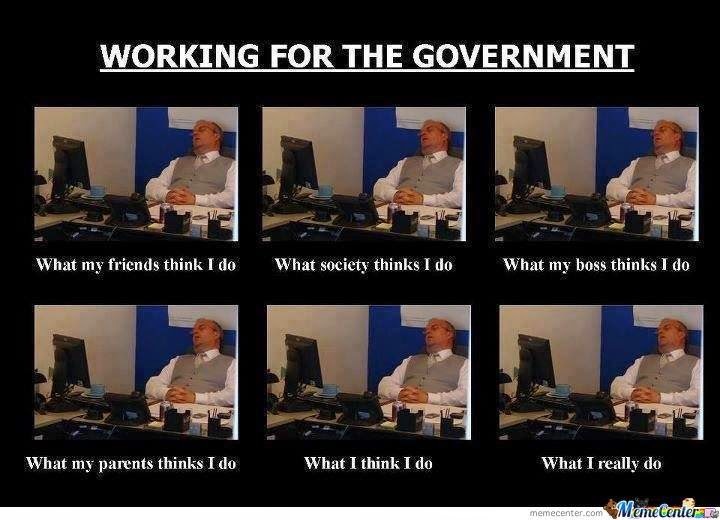 I’ve shared humor targeting particular bureaucracies, such as the Postal Service, IRS, TSA, Department of Energy, and National Park Service, but I don’t have nearly enough material mocking government bureaucrats in general. I should have dozens of examples. However, looking through my archives, I found just a handful of examples: a joke about an Indian training for a government job, a slide show on how bureaucracies operate, a cartoon strip on bureaucratic incentives, a story on what would happen if Noah tried to build an Ark today, and a top-10 list of ways to tell if you work for the government. I also found a good one-liner from Craig Ferguson, along with some political cartoons from Michael Ramirez, Henry Payne, and Sean Delonas. Those are all funny, but it’s not nearly enough. So let’s add to the list. Here’s some insight on what it’s like to get overpaid and underworked. By the way, if this image looks familiar, it may be because it has the same look as this six-frame image about libertarians. And if I haven’t exhausted your interest in anti-bureaucrat humor, here’s a related image. And last but not least, here’s a new element discovered inside the bureaucracy, and a letter to the bureaucracy from someone renewing a passport. Let’s close with one serious point. We should probably be happy that many bureaucrats are lazy. Sure, it’s an inconvenience when you’re waiting in line at the Postal Service or DMV, or when you’re on hold trying to get a straight answer from some random bureaucracy. But do you really want zealous and motivated people at the EPA, OSHA, EEOC, FDA, and IRS? Oh, their zealous and motivated when it suits them. They want an audit? You had better comply ASAP. You want a refund? Eh, you’ll get it when they get around to it.